This cute little gator was inspired by a card I saw on Pinterest made by Tami White. A lot of my stampers liked this card instantly and I am sure it's because of the punch art alligator. This set is perfect for this layered card technique. It looks far more complicated than it is. You can see the Strawberry Slush and Whisper White cardstock are cut in graduated sizes. To stamp the images, use a small amount of adhesive to stick the 3 white pieces together. Stamp the images while the pieces are stacked. It will look messy on the edges because it's not completely flat. No worries - when you layer with the Strawberry Slush, those flaws are covered nicely. I used my new favorite color combination of Rich Razzleberry, Strawberry Slush, and Sahara Sand and the Sale-a-bration Petal Parade stamp set. I paired it with Sassy Salutations which I recently learned is one of my customers' favorite set of words. Does this look familiar? The colors and the banners? I made this first and liked the banners and color combination so much I made a scrapbook layout too. The richness of the Rich Razzleberry on the Crumb Cake is such a nice combination that you may be seeing more of it! Last fall I went to visit a friend in Florida, and by coincidence I flew into Orlando on the last weekend of the Epcot Food and Wine Festival. We decided to check it out, and I am so glad we did. The weather was perfect and we spent the day eating and drinking our way around the world and having a great time. In addition to the countries you can normally wander in and out of, they had kiosks set up and we had food and drink choices from 30 different countries. I ate way too much, but I must say everything was delicious, and I plan to go again someday! I knew I was going to use the Sale-a-bration Banner Blast stamp set for a scrapbook layout, but these colors were unexpected. I made a card with them and loved the end result so I decided to make it into a 2 page 12 x 12 layout. They were perfect for the coloring on the sign and matched the festiveness of the day. This is a modified version of a swap card I received from Laura Borchert. Several of my stampers commented on it when looking through my recent samples so I decided I should do this for a stamp-a-stack. We stamped and cut the center flower out by hand, and in Laura's version she colored with the matching Melon Mambo and Calypso Coral markers. The bright cheerful colors were just want we needed on another sub-zero stamping night! 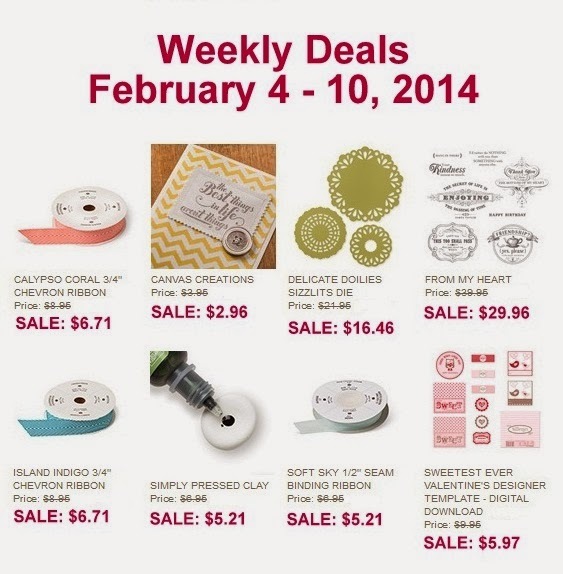 This Live Happy is from my Sale-a-bration You're Lovely stamp set. It was an extra piece and I wanted to make a quick card with it instead of toss it into my scrap pile. I fancied it up by running a piece of crisp cantaloupe ruffle stretch trim around on the back side and turned the piece I planned to mount it on perpendicular. I made this quick card to cheer up a friend. The adorable stamp comes from the See Ya Later Sale-a-bration stamp set. I wanted to use a new Sale-a-bration set for last week's stamp-a-stack, and it was the perfect set to help beat the winter blahs with this springy card. We used some of the newest in-colors and added a couple of butterflies. I wanted to make a few Valentines for my stamping friends, and when I saw this idea on Pinterest I knew I could do it with my Stampin' Up! bakers twine. I pulled out a variety of current and retired twine for a nice variety of Valentine "cards". You can see the original on my Valentine's Day board. We did this banner Valentine at my weekend Stamp-a-Stack. I think I know my customers pretty well, and I know how some of them feel about bows so I designed two options. Funny how the bows were pretty popular with the Friday night group and the Saturday morning group was happier with the non-bow version. It was fun to see who decided on which design. Also interesting to see the ladies turn it into a birthday card and an anniversary card. These bars of yummy, caramel goodness are called Carmelitas, and you can find the recipe here. It is one of my many Stamp-a-Stack treats that I found on Pinterest, and if I am asked for the recipe, I know it's a keeper. I've made them twice and they were a hit both times. 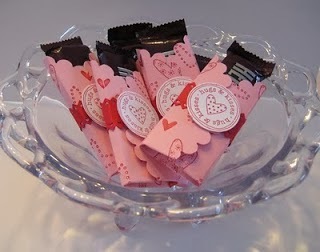 I am reposting these Valentine treats because it has been one of my most popular posts. I first made these a few years ago and posted them on Splitcoaststampers.com where they made the picture a featured upload! You can check out this post for the details. 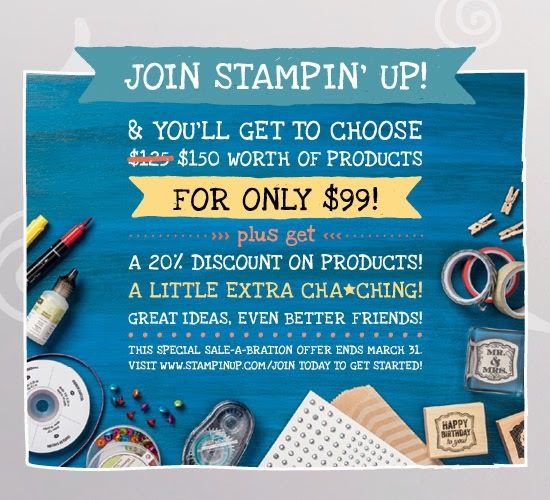 If you've ever thought about joining Stampin' Up! now is a great time! In your customizable starter kit you will get to choose $150 worth of products for $99. Then you decided what kind of demonstrator you want to be. Please email me if I can answer any questions or if you'd like more information. Here is my latest creation and yep - you guessed it. I was playing along with another challenge. This time I combine a Mojo Monday challenge with a ColourQ challenge. 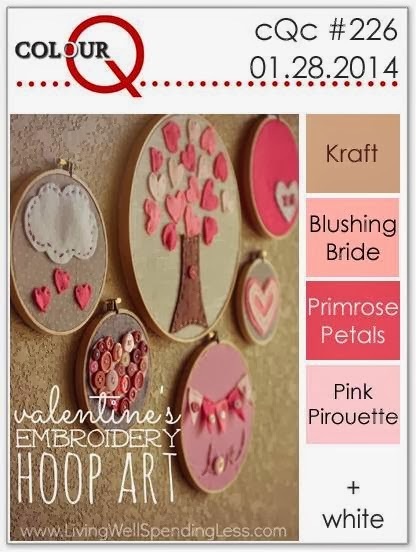 I generally am a slow creator, but when I saw these colors I knew I would do a valentine and thought this tall and skinny layout would be a great way to use my brand-new (just took it out of the box!) Follow My Heart stamp set. My friends know I am a big fan of the Eiffel Tower and have a few decorating my craft room. Although I held out for a long time, I broke down and order the Follow My Heart set so I could have that sweet Eiffel tower stamp in my collection. I have been to Paris and been up the Eiffel Tower, but I was on a tour and didn't get to spend the kind of time I would have liked to so going back to Paris and the Eiffel Tower is definitely on my bucket list! Until then, I will just have to make myself an Eiffel Tower card from time to time to get my fix. 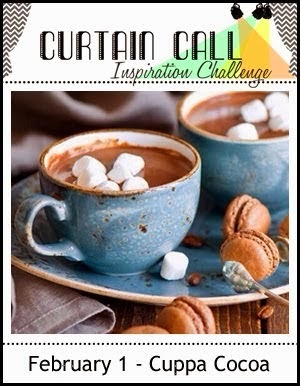 My friend Stacey over at Curtain Call Inspiration Challenge posted this Cuppa Cocoa challenge today. And since I have been trying to mix up my colors and layouts a little lately, I thought this would be a great challenge for me. It's a fun challenge because it's wide open and there are so many different ways to go with your creations! Although I knew I didn't have to feature hot chocolate or coffee, that was the direction my inspiration was taking me. Only problem was that I am not a coffee drinker and don't really have the right set for this card. So I went into my retired stamp sets that I can't possibly part with and found this Scentsational Season Christmas set. I didn't necessarily intend it to be a get well card when I started, but so many of my friends have been under the weather lately that I thought I would probably have a chance to use it before long. I used my new On Film framelit which just might be my new favorites.